This is the first in a series of articles to explain how to build Kitchen Production Formulas for items on your menu. In this article we are going to walk through creating a formula for a simple menu item; chocolate chip cookies. 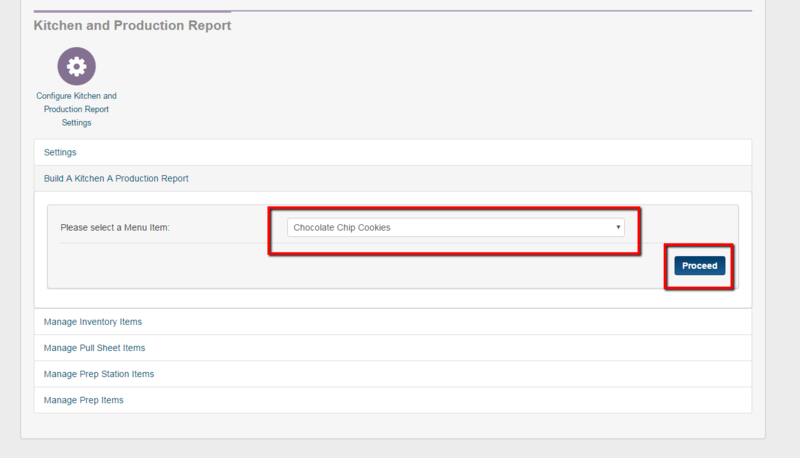 If someone orders 10 chocolate chip cookies on an order, you will need the Prep Report to let your kitchen know to prepare 10 chocolate chip cookies for that order. If 72 chocolate chip cookies are ordered, then your kitchen needs to know to prepare 72 cookies. We call this a simple menu item, as this single menu item only has a single prep item tied to it. There are no options (modifiers) tied to the cookie. In other words, you don't have to choose the cookie type. The menu item name tells you what it is. 1. We must first go to the area that controls the Kitchen Production Reports. 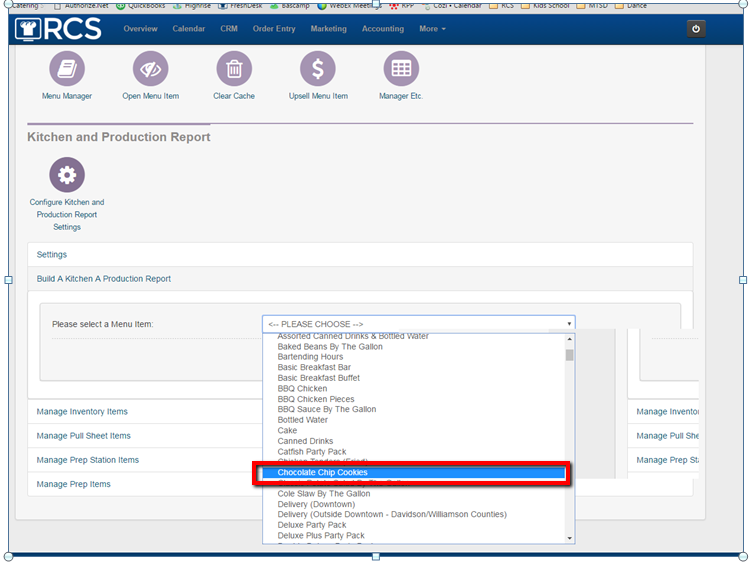 Go to the ADMIN tab and scroll down to the section called KITCHEN and PRODUCTION and click on the CONFIGURE KITCHEN PRODUCTION REPORT SETTINGS bubble and click on the BUILD A KITCHEN A PRODUCTION REPORT link. 2. There is a drop down to the right of PLEASE SELECT A MENU ITEM. Clicking on this drop down will bring up a list of all your menu items. Select the menu item you want to build a formula for. In our example, we are choosing Chocolate Chip Cookies. NOTE: DO NOT worry about the sections at the bottom of this picture called Manage Inventory Items and Manage Pull Sheet Items. That is part of another lesson. 3. You are now taken to the area to EDIT your formula. Notice the blue bar that says GENERAL PREP ITEMS. You will click this bar to access building your formula. 4. Notice the GENERAL PREP ITEMS bar is now orange. Click on the blue ADD FORMULA button to start building your kitchen production formula. 5. A light box pops up with the fields needed to build your formula. I would like ________ (Quantity) _________ (Units) unit of measure of Please Choose (Prep Item) For Every: ______ ordered. I would like 1 Each unit of measure of Chocolate Chip Cookies for every 1 ordered. It is advised to write out your formula in this format, before completing the fields. 6. In the "qty" box enter the number of the units of the prep item you need. So for the chocolate chip cookie example, we only need prep 1 cookie for each ordered. 8. ...Your ingredient Units of Measure will appear. You can choose one of the units already loaded into the system or create your own. To create your own unit of measure, just type in the unit of measure name into the box next to "Create a New Ingredient Unit" and click the SAVE button. An example of a unit of measure you may want to create is "Trays". If your sandwiches, cookies and brownies are prepped by the tray, then you may wish to have "Trays" as a unit of measure for your formulas. For our example we will select the unit of measure called "each", as that describes how we want the cookies prepped. 9. Moving to the next field there is a drop down box with the words <PLEASE CHOOSE>. If the desired prep item exists, select it from the drop down menu. NOTE: It MUST fall under the Prep Items heading and have (Prep) at the end. So in this example, Chocolate Chip Cookies (Prep ) exists and falls under the Prep Items heading. You may select his prep item for the formula. If the desired Prep Item does not exist, then click on the blue "Prep Item" button to the right of "Add new:" See pic below this one. 10. You will then see a blank box to enter your prep item into. This new prep item will be saved to your Prep Item list once the formula is saved. NOTE: Make sure you do not create the same prep item twice. Check your drop down box before creating a new prep item to make sure it does not exist. 11. To complete your formula, you must enter a number into the box to the right of "For every:" The default number is one. This formula format was created to help you calculate formulas without being an expert at decimals. For instance, you may calculate an overage on cookies in case one falls or someone would like another one. You could express the formula as 1.1 each Chocolate Chip Cookies (Prep) for every 1 ordered. Or you could use the formula: 110 each Chocolate Chip Cookies (Prep) for every 100 ordered. The software will convert your numbers into the right formula. At this point you have built the basic formula. Let's next discuss the other fields you may or may not want to fill out. 12. The next field is the Rounding Factor. You can choose to not round, as will always be the case in whole numbers. You can round up or down to the units below. 13. The next field is Prep Station. This identifies which station within your restaurant is responsible for prepping the formula item. See pic below this one of the pop up box that appears. You can create your own Prep Station by entering the name of the station in the empty box and hitting the SAVE button (red outlined box). Once created created, the Prep Station will always be available as a choice (green box). You will just click on the Prep Station box you want to use. 14. The next field is Food Prep Category. This identifies which station within your restaurant is responsible for prepping the formula item. See pic below this one of the pop up box that appears. You can create your own Food Categories by entering the name of the category in the empty box and hitting the SAVE button (red outlined box). Once created created, the Prep Station will always be available as a choice (green box). You will just click on the Prep Station box you want to use. Note the up and down arrows in the yellow box. This allows you to move your Food Prep Categories up and down the entire list. 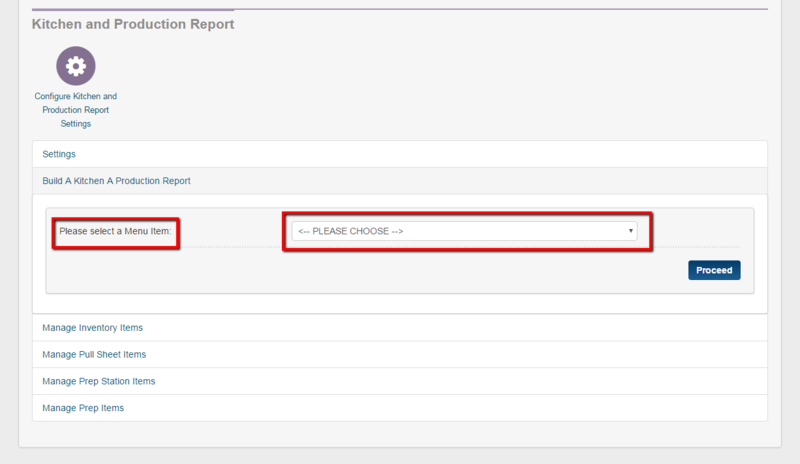 This is the order that will appear on your report(s). 15. The final field you may want to complete is the label field. This defines how many labels (address labels printable in the Reports Section) you want printed based on the quantity of the Prep Item made. For instance. If you need one tray for every 30 cookies prepped, you will enter the number 30 in the box. One label will be printed for up to 30 cookies. If 29 cookies are to be prepped, you still will get one label. If 31 cookies are to be prepped, then you will get two labels. 16. Double check your formula and make sure each field is completed. Then hit the blue SAVE button to save your formula. 17. Your formula now shows up underneath the orange General Prep Items in the blue bar.